Presenting Geek Girl #1 Geek Girl by Holly Smale. Geek Girl is the first book in a hilarious new trilogy. It was also the #1 bestselling YA debut of 2013 in the UK, where it was shortlisted for the Roald Dahl Funny Prize and won the Waterstones Children’s Book Prize for Best Book for Teens. With all the humor and fabulous shenanigans of Louise Rennison’s Confessions of Georgia Nicolson and Meg Cabot’s The Princess Diaries, Geek Girl is about to become an international superstar. Its light.Its original. Its hilarious and a laugh-out-loud fun fiesta. Its fashion and equally the hijinks of fashion. Its the hilariously hijinky metamorphosis of this socially awkward caterpillar into a butterfly. Tackling serious issues and giving it the hilarious spin and frankly full of facts and the sarcasm that will have you rolling on the floor laughing (basically rofl *wink*) and I have been reading a lot of serious fiction lately, so 'Geek Girl' felt like a great change in scenery. Geek = Harriet Manners. Seriously you just can't help not love her. She is silly. She is quirky. She can't stop herself from correcting others, starts to plainly spout off facts when she gets worked up ... she is plain and simple endearing. She has always defined herself as a geek but she doesn't want to be one. And then she gets spotted by a fashion agency and grasps her chance to get her much dreamed about metamorphosis. Of course she didn't expect modeling to be so different than she thought it would be and we as readers had the time of our lives, as we watch her stumble along this unexpectedly unplanned road & realize that she doesn't need outward help to be perfect but it is what's inside that matters. She grows through the story at an unparalleled rate. She makes mistakes. Makes a mess out of her life but she knows to learn from her mistakes. She just needs a little help to realize that she is perfect in her own way. There is friendship. There is hate ..... seriously she gets a nemesis too. And that knocking on doors first attraction with her super hot colleague Nick. Her relationship with her stepmother was the stellar point. Throughout the book you realize just how similar Harriet is to her step-mother right down to mannerism, that its just endearing. Wilbur was fabulous, quirky with all of his silly nicknames for Harriet and surprising little nudges on good advice helped us appreciate him more and just how instrumental he was in Harriet's metamorphosing from 'the ugly duckling' to that beautiful swan. 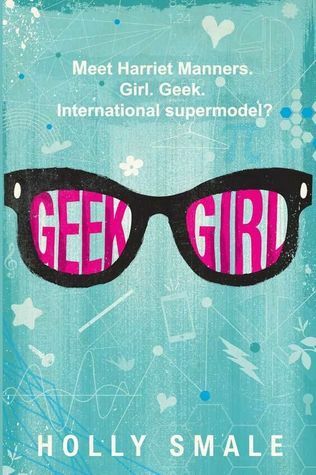 "Geek Girl" is just what you need when you are feeling down or looking to go for the unexpected because this is one coming of age fiesta you won't be disappointed to get your hands on. Highly recommended (if you haven't already done that). "A hilariously quirky & laugh-out-loud fashion fiesta"
I loved this book! It was such a fun read! Glad to see you liked it too. Wow. Great review. Thanks for sharing. This one does sound absolutely fantastic.